Celebrate with events all month long! Have sustainability-related events happening in April? 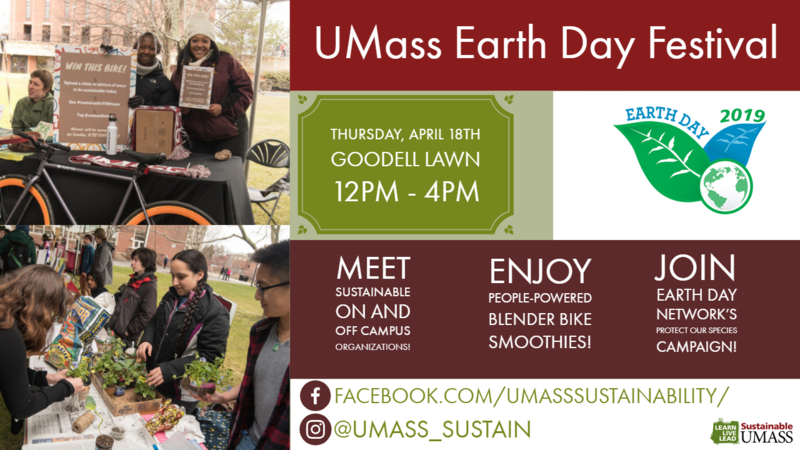 Send an email to sustain@umass.edu to get included in our Earth Month promotional materials! Explore the transformative social aspects of permaculture design principles with Abrah Dresdale, followed by presentations by recipients of the Libraries Undergraduate Sustainability Research Award. Come check the fine array of crafts, plants, natural cosmetics, art, and more! 11:30am: Dr Susanne Moser, "Hope in the Face of Climate Change: The Real New Deal"
Meet various sustainability-related organizations on campus (including vendors from the Farmer's Market) and in the greater Pioneer Valley! Test drive or ride electric vehicles and plug-in hybrids from BMW, Chevy, Honda, Hyundai, Mercedes, Nissan, VW, Tesla and others. Event is open to all. UMass employees should register through UMass Workplace Education for a special EV overview workshop at 11 a.m. to get two hours of release time. Come check the fine array of crafts, plants, natural cosmetics, art, and more! Have clothes that need repairs or a cool upgrade? Sign up for a repair fair slot here!